So you’ve heard of the term ‘painful arc’? This is one of many signs for impingement. 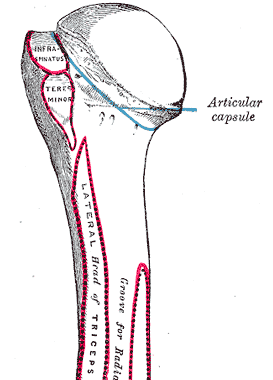 The greater tubercle of the humerus is the main structural cause of this. It is a protrusion of bone serving as an insertion point for 3/4 of the rotator cuff muscles. As it is on the lateral aspect of the humeral head when the arm is in neutral, external rotation is necessary for the greater tuberosity of the humeral head to clear the subacromial roof when elevating the arm. Ever wondered why it is between 60 and 110/120 degrees? This video shows how the greater tuberosity of the humerus passes under the acromion in shoulder abduction. Osteoarthritic spurs of AC joint. Thick subacromial – subdeltoid bursa. 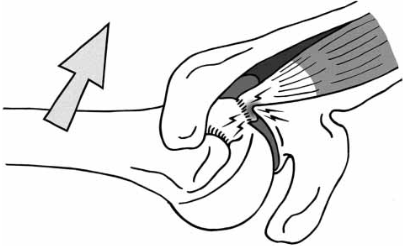 Friction/compression of the long head of the biceps tendon. Reduced upward rotation of scapula. So…Primary shoulder Impingement? or Secondary to joint instability / scapula dyskinesia / bad posture / joint structure…? 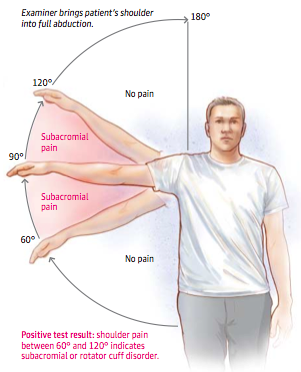 Primary shoulder impingement can be defined as a narrowing of the subachromial space in a stable shoulder. Secondary impingements can involve different anatomical structures which can be internal (within the capsule) or external (outside the capsule), this can depend on the motion and loading put on the shoulder during the pain provoking activity. Secondary impingements generally take time to occur and may follow a history of neck/shoulder injury. For an outlet impingement to occur, the outlet a.k.a the SA space, is TOO SMALL to allow the structures which move under it without friction. This can be the SA bursa or the Rotator Cuff (RC) tendons which become irritated, inflamed and mechanically sensitive. This all leads to PAIN with movement, known as ‘Impingement Syndrome’. So how does this space get too small? 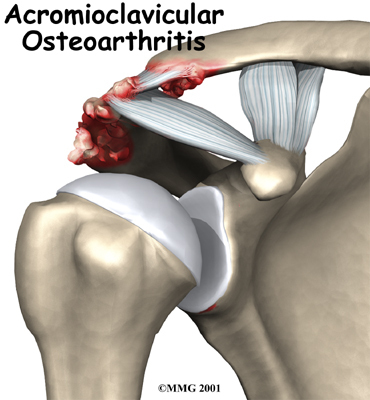 ii) Osteoarthritic spurs of the acromioclavicular joint and subacromion. These spurs (osteophytes) are caused by ‘wear and tear’ factors and are associated with Osteo Arthritis. They are also common in the spinal vertebrae where they are mostly non symptomatic. iii) A thickened or calcified coracoacromial ligament, this would impinge in the inferior direction. iv) The subacromial-subdeltoid bursa is usually thinner than 2 mm. Thicker than this and it could contribute to impingement. Technically this is a structural problem, however, the thickening of this bursa could be an early sign of subacromial impingement and possibly a rotator cuff tear. This would then be a secondary impingement. Secondary Impingement – Postural or Movement related. Arthrokinematic (joint movement) movements include rolling, gliding and spinning movements between joint surfaces. Osteokinematics (bone movement) describes movement between bones, so you could say arthrokinematics create osteokinematics. Shoulder abduction is an example of the osteokinematic movement ‘angulation’ in the GH joint. In this movement, rolling creates the angulation, and gliding keeps the humerus in the glenoid cavity. Hyperangulation is when rolling occurs, without sufficient gliding, and so the humeral head moves out from the glenoid cavity. So you could say ‘hyperangulation’ means too much rolling! For impingement, this occurs superiorly, which can be due to rotator cuff pathology such as a tear, loss of strength or lack of activation. So lets look at this very simply. 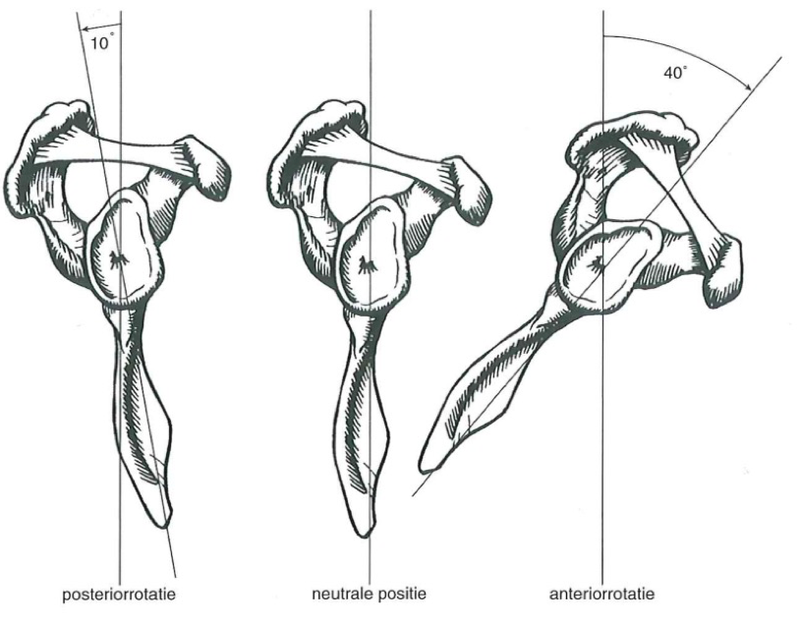 If the humerus is migrating superiorly and impinging on tissues….we want it to move inferiorly right? Can you think of a muscle which inserts into the humeral head and originates more inferiorly to it? The infraspinatus is usually a strong muscle which inserts very close to the axis of rotation, especially in abduction. Being closer to the axis than the teres minor means it will more likely perform a slide/glide/translation, instead of an angular movement. The oblique head is closest to the vertical line we need for this, and so will be the main influencing fibers for the downward slide/translation of the humeral head. SO training of External Rotation (ER) in 90′ abduction is your best bet (Hughes et al 2014) to activate/strengthen this muscle and movement. This action is essential especially in the 60-120° …the painful arc! Check out my Convex – Concave Rule Explained page to remind youself how the direction of the slide/translation depends on whether the moving surface is concave or convex. Quick Note: Dynamic Humeral Centring (DHC) is a therapy technique from France. It aims to reduce subacromial pressure by lessening superior glide and assisting inferior glide of the humeral head during arm elevation. DHC involves co-contraction of latissimus dorsi and the lower fibres of the pectoralis major, both of which have a downward pull on the humerus. Coordinated rotator cuff activation is essential to maintain sufficient contact between the humeral head and the glenoid fossa during movement. Notice how I chose the word ‘coordinated’, this is because each of the muscles must activate at the right time and with the right strength to suit the demand. Many factors, forces and movements of an unstable shoulder can cause the humerus to impinge tissues within the shoulder outlet. Mild forces on an unstable joint can displace the humerus superiorly to an impingement. Also trauma from a Fall On Out Stretched Hand (FOOSH) injury can cause damage and inflammation to the joint and its tissues. Inflammation is a natural process for tissue repair and so physiotherapy may not be indicated. If inflammation is prolonged then NSAIDs may be advised, and physiotherapy could be needed to restore function when lost. iii) Non Outlet impingement (impingement within capsule) – Technically this is not a SAPS. The picture below shows posterior-superior glenoid impingement in the shoulder: the rotator cuff tendon is impinged between the glenoid labrum and the greater tuberosity. Adapted from Jobe (1995). Unlike subacromial impingement, there is no single pathomechanical process that leads to internal impingement, although many biomechanical explanations have been proposed. Of these, there is a relatively high consensus that the repetitive, extreme ranges of GH (glenohumeral) abduction and ER, along with underlying shoulder dysfunction, are likely the prime culprits leading to the development of internal impingement (Heyworth & Williams 2009). So with that combination of movements, does a sport come into mind? Yes, throwing sports. Jobe et al. also reported that from repetitive overhead throwing, fatigue and/or weakness of the scapular retractors causes a decreased force production in all four of the rotator cuff muscles (not to mention stretching of the capsular ligaments…but we will come on to that later), which would lead to abnormal positioning of the GH joint. This movement can result in hyperangulation (again) caused due to impaired muscle coordination during movement. The difference this time is that the greater tuberosity impinges the inner articulating fibres of the rotator cuff against the (posterior-superior) glenoid labrum (Jobe 1996). iv) Reduced Upward Rotation of the Scapula. Lets look at the osteokinematics of the scapula and humerus and the muscles controlling this. So we have one bone (humerus) moving on another bone (scapula), which moves on other bones (ribs). This combination creates the ScapuloHumeral Rhythm (SHR), which is the combination of GlenoHumeral and ScapuloThoracic movement. Correct SHR is required to achieve full upper limb elevation. SHR = GH + ST movement. 50-60° of abduction in the scapular plane. Generally, in the first 30° of flexion/abduction the scapula remains stationary. After this, a combination of humeral and scapular movement in a 2:1 contribution respectively occurs. So for every 10 degrees of scapular upward rotation, the GH joint will have moved 20°. This creates a maximum range of upper limb elevation of 150° to 180°. So whats this all got to do with impingement? Well a reduction in the GH degrees will unlikely leave you with an impingement…. However, a reduction in the upward ST rotation degrees can! NOTE: Some mild co-contraction between these is normal for stability and complex/combined abduction movements. Lastly, if any of the downward rotators are shortened or high tone, this could also reduce the upward rotation. 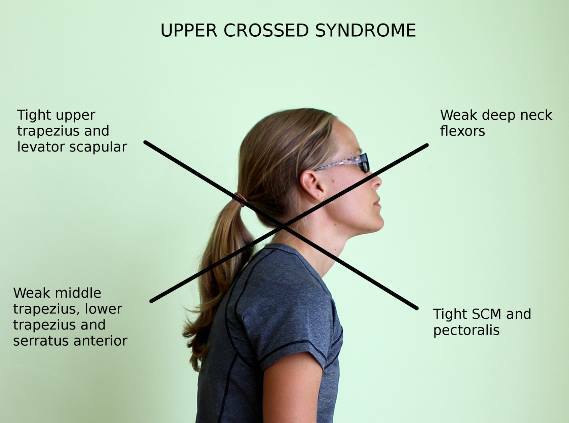 The most common posture which springs to mind is ‘Upper Crossed Syndrome’. Im sure many of you will recognise this posture in someone you know. Have a look at all the muscles involved, especially the tight pectorals minor which presents the main problem for us. The pec. minor originates on our 3rd – 5th ribs and inserts into the medial boarder and superior surface of the coracoid process of the scapula. These attachments allow it to perform scapular depression and slight abduction around the thorax. When the scapula is fixated, it also acts as an accessory muscle of breathing. When the pec minor is tight or shortened over time, the scapula abducts making the middle and lower trapezius weak and lengthened. Posture shows a rolling of the shoulders, the thoracic spine extensors become lengthened and weak creating a dorsal kyphosis, along with a forward posture of the head. So how does all of this sound for your upward rotation? Actually, aside from your potentially weakened lower trapezius, your upward rotation works fine! Now that your scapula tilts forward… ‘up’ is not quite ‘up’ anymore…its more… forward. Your 180° forward flexion still exists, just in your new altered scapula position. If you look at the picture above, you will see a 40° anterior tilt, this will take 40° off your vertical 180°. At the same time, giving you an extra 40° in GH retroversion. Sounds great, so wheres the impingement? Well, the above explained a tight pec. minor with anterior scapula tilt in the non pathological (although functionally impaired) shoulder. Impingement can occur when the pec. minor restricts upward scapula rotation, and posterior tilt of the scapula… Creating problems explained in the previous section. NB: Adhesive capsulitis can also contribute to secondary impingement, but is generally easily identifiable due to the substantive losses in both active and passive range of motion in multiple directions of motion (especially ER). In COPD patients the ineffective pulmonary function are related to the bodies inability to comply with breathing demands. Accessory breathing muscles are called upon when respiratory demands are not met and the pectorals minor is one of those. As mentioned they can act to elevate the ribcage. Overuse of this action can cause hypertonia of the muscle, leading to a shortened muscle length. Interestingly; breathing patterns differ in children (abdominal), women (upper thoracic), men (upper and lower thoracic) and the elderly (lower thoracic and the abdominal area) (Magee 2008). EXTRA: Tight pec. minors in weight lifters? The majoity of weight lifters love to bench press, you can get very fast increases in strength, and can arguably lift the heaviest weight with this upper body movement. So why not bench your way to a new body? Well… you will also be benching your way into a muscular imbalance. In the same way the COPD patients get high tone and short breathing muscles with over activity, doing too many scapula protraction exercises will leave you with increased anterior tone. Eventually, this will pull your scapula in a more protracted position, allowing your high tone pec. minor muscles to shorten over time. Balancing this exercise with rows and other pulling exercises will maintain health posture, which is what we’re all about. Stay tuned for the next page on Instability, and follow my Twitter and Facebook page for posts.